Because even a momentary glitch in power can spell disaster for the airline, Southwest needed highly reliable UPSs to protect critical equipmnet at its headquarters campus and several reservation centers across the country. To complement the numerous legacy UPSs thar are operating efficiently in large part due to regular maintenance, Southwest purchased several new Eaton 9355 UPSs with service and monitoring plans. A few years ago, a lightning strike took one of the airline's UPSs offline. 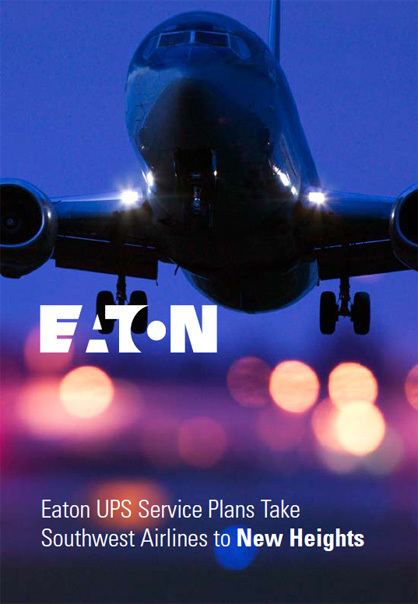 Eaton service techs responded quickly and diligently, just as it had for many years in helping ensure the ongoing health and operation of the airline's UPS units. When Southwest needed to replace four systems, the airline decided to continue contracting with Eaton to provide UPS service and new UPS units based on its long and successful history with Eaton and overall satisfaction with Eaton customer service engineers.